Recent research suggests that a key factor in glioma progression is the growth of new blood vessels via stem cells from bone marrow. This study involves a retrospective chart review and outpatient survey of patients who have already undergone endoscopic skull base surgery at our institution by the PI (Dr. Theodore Schwartz). The purpose of this project is to use excess bone marrow taken during spinal fusion surgeries to isolate human mesenchymal stem cells for use in tissue-engineered constructs. Low grade gliomas are brain tumors with usually poorly defined borders between tumor and normal brain. This characteristic of low grade gliomas makes the gross total resection of the tumor extremely difficult. 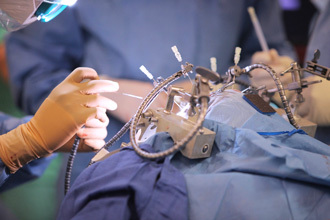 Nevertheless, several studies have demonstrated that the risk of recurrence and progression into a more malignant tumor can be decreased with a more aggressive surgical resection. To assess the capacity for long-term hemispheric reorganization of language via neuropsychological measures of language function in pediatric patients one to ten years after left hemispheric tumor resection. In this study, patients suffering from a chronic subdural hematoma that has failed conservative medical management and who are candidates for open surgery to evacuate the clot will be offered middle meningeal embolization as an alternative. The purpose of this study is to collect previously obtained brain cancer tissue samples to perform molecular characterization. The purpose of this study is to evaluate the outcomes of children with probable isolated calvarial eosinophilic granuloma (EG) managed with an initial protocol of observation only. Dr. Y. Pierre Gobin of Weill Cornell and Dr. David Abramson of Memorial Sloan-Kettering are conducting a study to track the use of intra-arterial chemotherapy for retinoblastoma (a cancer of the eye in young children). This procedure saves approximately 80 percent of eyes in children who are referred immediately with no prior treatment, and 50 percent of eyes in children treated after having failed prior treatments at other institutions. Sequencing of advanced and metastatic tumors has the potential to contribute substantially to the scientific community. Currently, there is no effective treatment for glioblastoma multiforme (GBM). The purpose of this study is to use Fluorescein Sodium, which is a type of dye, to help the surgeons get a better picture of brain lesions in the operating room during surgery.